While open to all academic approaches and disciplines, an emphasis was placed on a humanities perspective for the interpretation and understanding of these responses. See the following summary of a "humanities perspective" as developed for this exploration. The faculty and student responses were conveyed through a series of presentations - a blend of talks, exhibitions and performances, including lectures, readings, art exhibits, dance, musical and theatrical events, as well as reflective discussions. All presentations were held during the Fall and Spring semesters, 2011-12. 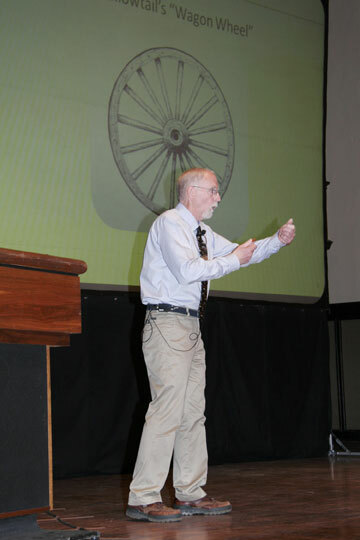 Frey at Keynote. Click to Enlarge. Inaugural event, a "key" unlocking the year-long Humanities Exploration series of interactive experiences, lectures, exhibits and performances. 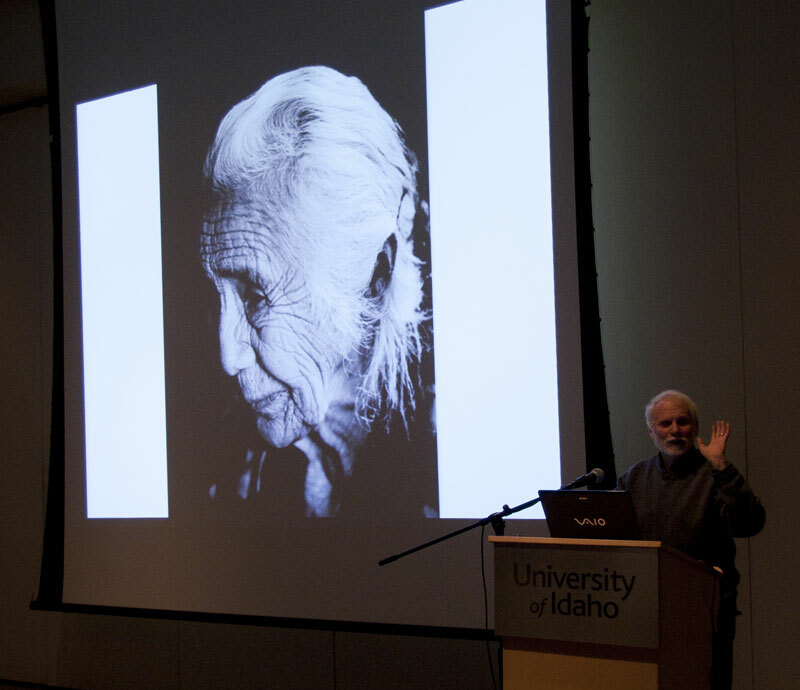 Keynote Address given September 1 Legacy Pointe Boise Center (30), September 8 Coeur d'Alene Center (45), and September 12 Administration Auditorium, Moscow Campus (350). A colloquium talk given September 13 (37). Dan Bukvich (Professor of Music) with Navin Chettri and the Jazz Choir I. An evening of engaged voices and rhythms preformed on September 21 (103). A colloquium talk given September 27 (76). Adoration of Dora has won the prestigious 2011 David Mark Cohen National Playwriting Award (supported by the Kennedy Center American College Theatre Festival, the Association for Theatre in Higher Education, and Dramatic Publishing Company). This play was co-sponsored by the Humanities Exploration and performed on September 29, 30, October 1, 6 - 9 (1,276). WARNING: adult themes and content, not suitable for all audiences. A colloquium panel discussion given October 4 (32). A colloquium talk given October 18 (32). A colloquium talk given November 1 (40). An evening workshop and performance held November 8 (45). A colloquium talk given November 15 (50). An evening of essay readings held November 29 (45). A colloquium talk given December 6 (100). Voxman giving talk. Click to enlarge. A colloquium talk given January 17 (45). Communicating Communication through Black and White Photography: Connecting the Diverse with the Shared in Common. 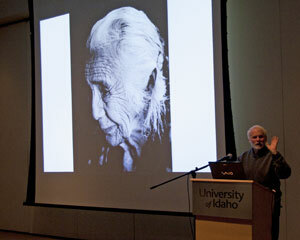 - An exhibit of Voxman's photography was held in the Reflections Gallery in the Commons between January 9 and 27. A colloquium talk given on January 24 (45). A colloquium talk given on January 31 (75). A colloquium talk held on February 7 (45). A colloquium talk given on February 14 (125). A colloquium talk given on February 21 (53). A colloquium talk on February 28 (117). Road Stories, the art exhibit, was installed in the Reflections Gallery in the Commons from February 20 - March 3. 03/06 - The International Community Looks for . . . Community? A colloquium talk given on March 6 (60). A colloquium talk given on March 27 (65). A colloquium talk held on April 3 (50). Held on the evening of April 3 (35). A colloquium talk on April 10 (30). Panel members share their experiences in a panel presentation held the evening of April 10 (20). A colloquium talk delivered April 17 (60). A talk given the evening of April 17 (30). A colloquium talk given on April 24 (70). A colloquium talk given on November 6.